Record of experiments, readings, links, videos and other things that I find on the long road. Registro de experimentos, lecturas, links, vídeos y otras cosas que voy encontrando en el largo camino. Interesting Talk: "In Search of Doors"
The Beverages Prices Refactoring kata: a kata to practice refactoring away from an awful application of inheritance. I created the Beverages Prices Refactoring kata for the Deliberate Practice Program I’m running at Lifull Connect offices in Barcelona (previously Trovit). Its goal is to practice refactoring away from a bad usage of inheritance. The code computes the price of the different beverages that are sold in a coffe house. There are some supplements that can be added to those beverages. Each supplement increases the price a bit. Not all combinations of drinks and supplements are possible. To make things worse, we are asked to add an optional cinnamon supplement that costs 0.05€ to all our existing catalog of beverages. We think we should refactor this code a bit before introducing the new feature. We hope you have fun practicing refactoring with this kata. Interesting Talk: "Mastering Spark Unit Testing"
ClojureBridge is an all-volunteer organization inspired by RailsBridge that provides free, introductory workshops to increase diversity in the Clojure community. 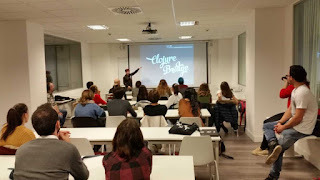 I first learned about ClojureBridge thanks to a talk by Ali King at EuroClojure 2015 in Barcelona: ClojureBridge, Building a more diverse Clojure community. I really liked the idea and we (the Clojure Developers Barcelona) tried to organize one in Barcelona, but failed to actually do it because we lacked the numbers, money and time. So the moment I knew that my colleague at GreenPowerMonitor, Estíbaliz Rodríguez, and the company where she works, Magnet, were planning to organize a ClojureBridge edition in Bilbao for December 1st 2018, I decided to do my best to help. I met Estíbaliz and José Ayudarte at the beginning of last summer, when they started working as ClojureScript developers for GreenPowerMonitor, and it’s been a great experience to work with them. They are part of Magnet which is a cooperative of developers, designers and consultants that work with Clojure and ClojureScript. Magnet’s team is distributed across Europe but most of them live in the Basque country. I told them I’d like to participate as a volunteer. Actually I had already bought the tickets and booked an accommodation for that weekend before asking them. In the worst-case scenario, if I couldn’t participate in ClojureBridge, I’d at least spend a weekend in Bilbao which is a wonderful city. In the end, everything went well and they told me they were delighted to have me there. I participated in a couple of meetings to know the other volunteers and talk about how the event would be structured, the mentoring and the exercises. Magnet was sponsoring the event and most of its team worked very hard to make it possible. So, on December 1st I was there trying to help people learn a bit of Clojure. There were many women and girls with very diverse backgrounds: professional developers that were using other languages, teenagers with a bit of programming experience from school or without, little girls and women of all ages that had no programming experience. At the beginning, Usoa Sasigain gave a talk to introduce ClojureBridge's goal of increasing diversity in technology, the important role women had played in the history of computer science and technology, and Clojure. 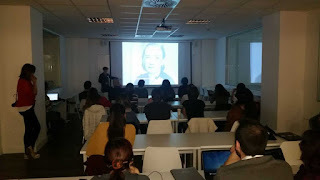 She also talked about her personal history with technology and Clojure, and explained how technology might be a nice career option for women. After the introduction, the participants were splitted in groups according to their programming experience. I was assigned to help the group of experienced software developers. They worked through the exercises in Maria Cloud which is a beginner-friendly coding environment for Clojure and I answered to questions about Clojure and helped when they got stuck. I think they got to appreciate Clojure and the possibilities it offers. 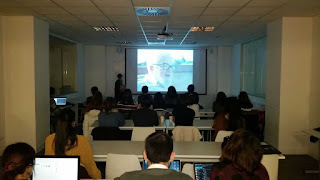 We did several coffee breaks during the morning and for lunch in which we could talk about many things and I had the opportunity to meet Asier Galdós, Amaia Guridi, Iván Perdomo and other members of Magnet. The lunch was very nice and sponsored by Magnet. At the end of the first half of the event, some attendees had to go to have lunch with their families. A funny and lovely anecdote for me happened when two girls of about six or eight years old that had been enthusiastically programming all morning didn’t want to stop and leave with their parents for lunch. I remember with a lot of tenderness seeing them totally engrossed in programming during the morning and celebrating with raised arms every time they succeeded in changing the color or any other feature of the shapes they were working with in Maria Cloud’s exercises. During the afternoon, we continue working on more advanced Maria Cloud exercises. There were less people, so I changed to work with some women that had no previous experience with programming. It was a very nice experience and we had a good time going through some more Maria cloud’s exercises playing with shapes. All in all, volunteering in ClojureBridge was a very beautiful experience for me. I enjoyed helping people to learn Clojure and programming, and met many nice people with many different backgrounds. I learned several words in basque language. I also had some very interesting conversations with Asier, Usoa, José and Iván about Clojure, Magnet’s experience as a Clojure/ClojureScript cooperative and the interesting platform, Hydrogen, that they are building. We also talked about my doing a desk surfing with them, an idea that I was really excited about, but, unfortunately, I haven’t been able to do yet because I recently started working for a new client in Barcelona. Before finishing I’d like to thank Magnet for making the first ClojureBridge in Spain possible and for letting me help. I’d also like to send love and good energy to Estíbaliz. I hope you recover soon and we can meet each other in Euskadi or somewhere else.